Do you bale a few acres a year for your own herd? Or are you a commercial producer covering thousands of acres a year? 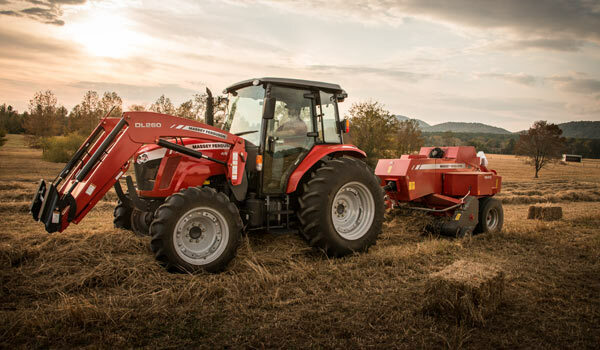 Either way, there’s one small baler line that can do it all: the Hesston by Massey Ferguson 1800 Series. We're proud to be your Western Slope source for theses small balers. Featuring the same in-line design as their industry-leading big square balers, the 1800 Series runs directly behind the tractor and straddles the windrow like a round baler. Competitors' balers use the plunger to form, cut and compress hay which is then side-delivered through the bale chamber to become an individual bale slice. But in the 1800 Series, these operations happen between the pre-forming chamber, packer-stuffer and plunger, minimizing peak loading on the entire drive system. Because each bale flake is pre-formed before it goes into the chamber, the nutritious leaves are more evenly distributed to each side of the bale. Here’s the bottom line on the Hesston 1800 small baler line: banana bales are impossible, the hay is better, and you’re not as tired at the end of the day. Questions about the Hesston equipment line?